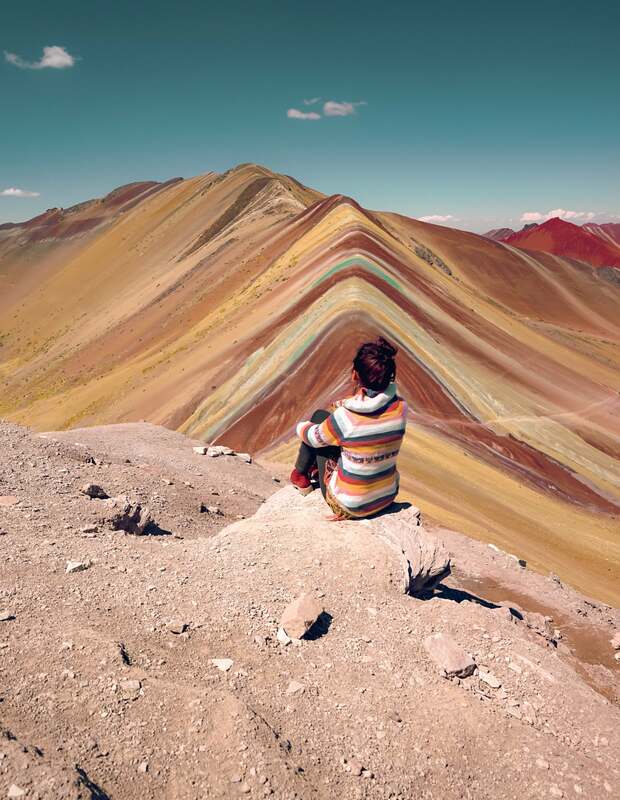 If you don’t know Marti Gutfreund’s work, at first glance, you might dismiss her @enchanted.forest moniker as being just another selfie-taking Insta-star. But then something happens. You’ll pause as something in the photo catches your eye. Gutfreund is an artist and member of the Alpha Imaging Collective whose images aren’t just run-of-the-mill selfies. She transports her 551K followers into the scene inviting them to be in the moment with her. Gutfreund’s photos don’t just happen when she arrives at a cool-looking vista. It’s not about luck. As Thomas Jefferson wrote, “I’m a great believer in luck and I find the harder I work, the more I have of it.” Gutfreund painstakingly prepares for her photos. She transports the viewer into a moment that she’s previsualized as thoroughly as possible. We caught up with Gutfreund to learn more about how she works and about her experience shooting outside of her comfort zone when she was in Australia with the Collective. Alpha Universe: You shoot and post a lot of images that have you placed in them as part of the composition. They seem to be created with a substantial amount of planning and intention. What is the process you go through creating those? Marti Gutfreund: Well it's definitely like a mixture of a lot of things. As much as I can, I try to look up the location beforehand so I have an idea of where exactly I want to set up, especially if I'm shooting for sunrise or sunset. I really like to have a clear idea of what I'm doing because it can get pretty stressful if you're fighting the light. I also bring outfits that will work with the landscape. I try to always plan out color schemes between my outfits and the landscapes. I usually either stick to complimentary colors, so if I'm near a blue lake I'll probably wear an orange dress, or colors that reflect the actual landscape. You'll never catch me wearing a purple dress with red flowers. That just wouldn't work because it's not complimentary and it doesn't really match the landscape. Another thing I plan out beforehand is where exactly I want to set my gear up before the light gets good. As much as I plan, I can't know exactly how the location looks ahead of time. Sometimes I get there and I realize that maybe something I saw on the Internet was taken with a drone or whatever and then I have to improvise. Alpha Universe: Let’s talk about your gear for a moment. What camera and lenses do you use? Marti Gutfreund: I’m currently shooting on the Sony α7 II and I've really got my eye on the α7 III. That's going to be my next one for sure! As far as lenses, the Sony 16-35mm f/4 is my go-to. I use that for probably 80% of my shots. It's just a really easy to use lens that’s super versatile. Particularly if I'm hiking and trying to pack light, I usually just bring the one lens. I also have a Sony 55mm f/1.8 that I use for portraits. I really like that one. I also have the Sony 70-200mm f/4. I hadn’t actually really used that one much until I went to Australia. I bought it and then I played around with it a bit and kind of gave up on it. Then I brought it to Australia and that was the first time I actually really started to like that lens a lot. Alpha Universe: What changed for you with the 70-200mm? Marti Gutfreund: I took it out at Yellow Water Billabong and it was like a National Geographic moment. There were thousands upon thousands of birds everywhere. It was incredible. I took the 70-200mm out and it was amazing seeing what shots I was able to get with it. I'll definitely start using that lens more after that experience. 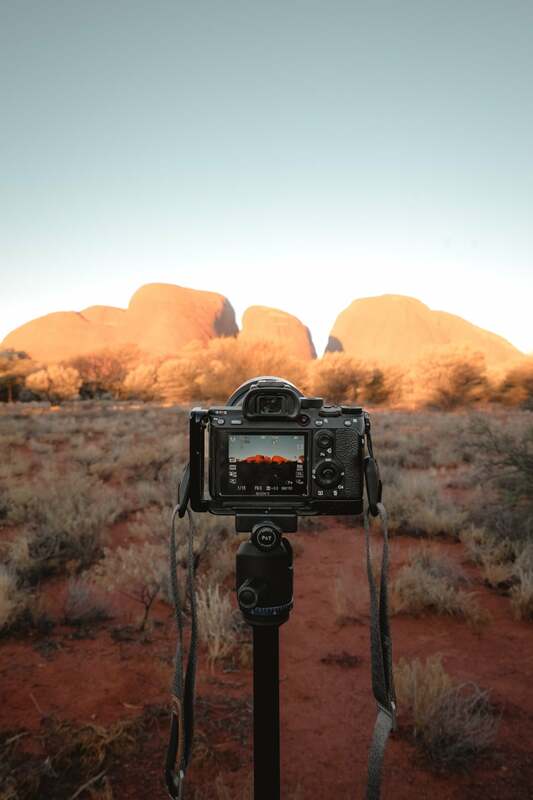 Alpha Universe: How do you set up your gear to reflect the visual composition you’re seeing in your mind? Marti Gutfreund: It depends a lot on the terrain and how crowded it is. If it's crowded, I try to avoid setting up my tripod. Some areas have hundreds upon hundreds of people all lined around the shore making it quite difficult to set something up. I usually go with my partner to locations like that and I'll have him take the shot exactly how I want it. He's gotten pretty good at doing that! Otherwise I use the PlayMemories remote shutter app. I set up my tripod and I hide my phone in my hand as I get into the pose. Flowy dresses really help with that because I can hide the phone quite easily behind the fabric. That app is great. Alpha Universe: Do you ever find that the colors you saw online and the colors you see on location don’t match? Marti Gutfreund: The subtleties in tone and such in the clothing don't really matter. I do a lot in post that lets me fine tune that. For instance, if I'm wearing something orange but I’d prefer if it to be yellow, I'll just switch it to yellow in post. Alpha Universe: Australia was a new experience for you and a very different group of locations from where you usually photograph in Canada. Knowing the itinerary of the trip, did you do any special preparation to shoot specific images or was it a little bit more on the fly? Alpha Universe: Because Australia was such a different location, did you try any new or different techniques from how you usually work? Marti Gutfreund: There were some that I did that I haven't tried before. I made one image at one of the water holes out in the middle of a dry region. There were some rocks that I was hopping across and I set up my tripod and had asked someone to click the shutter button while I was jumping across. Looking back, I would have liked to perfect it a little more—my shutter speed was a little too slow I think. I had never done something like that before where I was actually in motion. I usually just do static photos, but I really liked the results. I think moving forward, catching myself in motion is something I will do a lot more of. 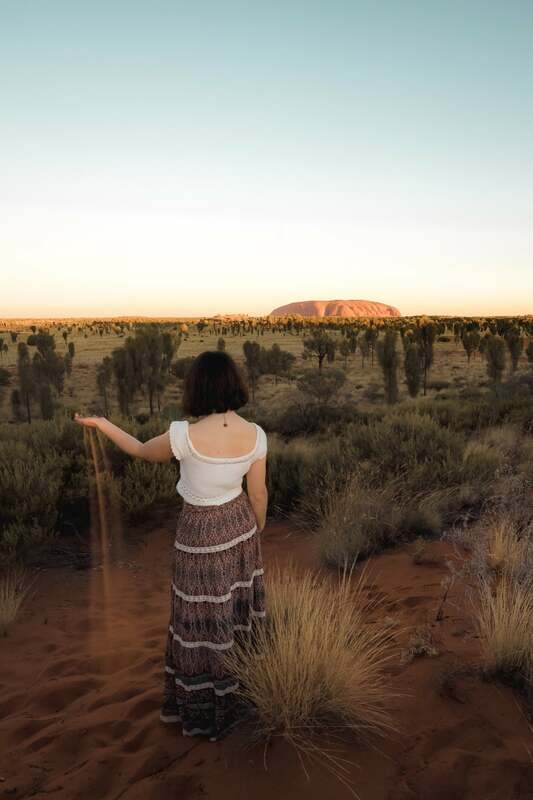 I would say the Australia trip was quite a challenge for me, especially coming from Alberta where the landscapes are so grand and crowded and there's lots of different contrasting colors and such. In Australia, all of the landscapes were much more subtle, sparse and quite flat in comparison. There’s not as much going on in terms of color palette. It was a pretty big challenge for me. However, as a learning experience, it was quite incredible because it challenged me to like shoot things that I'm not used to with variables that were foreign to me. 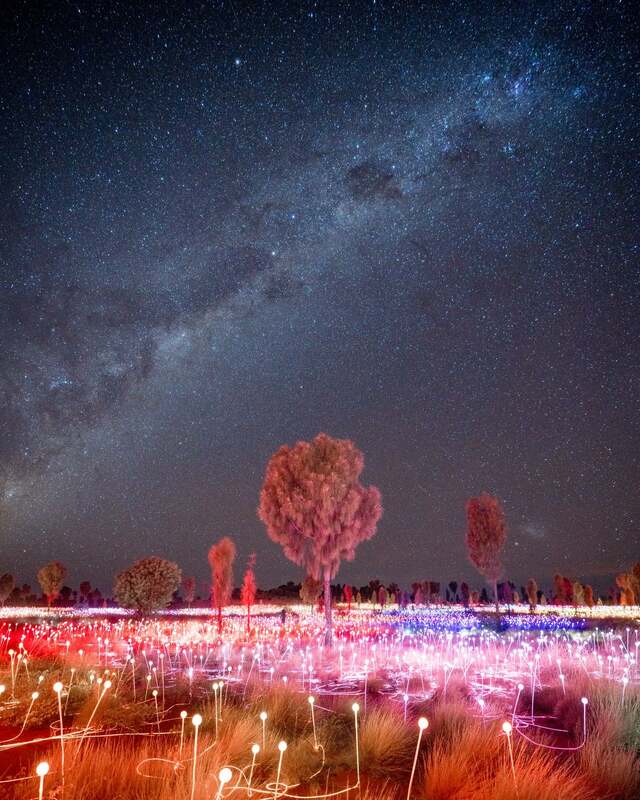 For example, one of the things that we had on our itinerary was an art installation at Uluru called the Field of Lights. It's thousands of fiber optics laid out in a field. It was quite amazing but I'd never shot something with that type of light before. I actually learned quite a bit about night shooting just from being exposed to that location and being out there with other photographers who had a lot more experience shooting with low light. I think in terms of learning, being sort of pushed into a zone that I’m not exactly comfortable with was really good for me. It was especially valuable in terms of finding composition with landscapes that are not giving me as much visually, thus making me work with things like finding lines that to make it more visually interesting. Photo by Erin Sullivan (@erinoutdoors). Field Of Lights, Uluru, Northern Territory, Australia. Alpha Universe: On a trip like this one, you do have a really interesting and diverse cross-section of specialties so it does become a creative exercise for everyone to pass around the knowledge that they bring to the table. When you’re immersed in an environment or situation you’re unfamiliar with, it helps to have a close knit pool of people who are so willing to collaborate and teach each other. Marti Gutfreund: Yes, absolutely! It's funny too because Alberta is really saturated with photographers. Just about everyone is a photographer over here because we have the dramatic mountains. However, everyone's used to just shooting the mountains and lakes which ends up creating the same kind of images. Being surrounded by people who come from a different part of the United States and Canada was really amazing because they're used to shooting totally different landscapes than I am. So I found that the diversity of knowledge was way bigger than when I'm meeting up with like people just from my area.